Let me start by saying that I’m a dip fanatic! I eat carrots and hummus on a daily basis and if I let myself, I could live on chips and salsa. I’m always on the lookout for new dips and many paleo fanatics have told me that they really miss hummus. 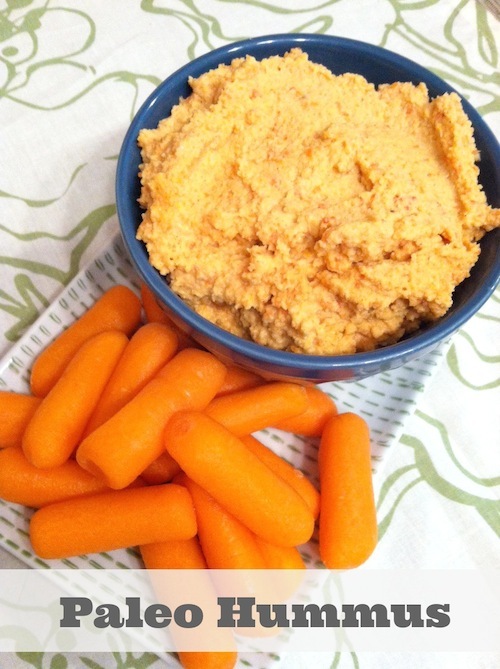 So here’s a delicious and satisfying hummus recipe for all you paleos out there! I replaced the chickpeas with roasted cauliflower and added roasted red pepper for flavor. Place the chopped cauliflower and the red pepper on a jellyroll pan. Add the coconut oil and roast at 425 degrees for about 30 minutes. Stir occasionally as the cauliflower browns and coat in coconut oil as it melts. Rotate the red pepper so it browns on all sides. Peel the skin off the pepper, remove stem and seeds and add to food processor along with the cauliflower. Notes: Experiment with extra spices to fit your taste buds and adjust the number of garlic cloves depending how strong you want the flavor. This would also be good with some added cayenne pepper or a jalapeno, for added spice. While this isn’t an exact replica, it’s a darn good variation of hummus. Serve with a big plate of veggies and dig in!